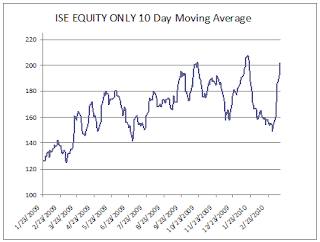 Below are graphs of the ISE and CBOE equity only 10 day moving averages. As you can see both are in areas that have previously led to selloffs. The put/call ratios are lining up for a top with two caveats. The first is that they still can go higher through the end of the week as I explained in a post yesterday. 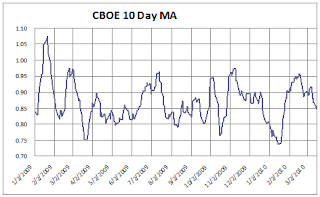 The second is that the overall CBOE put/call ratio is not in extreme territory. 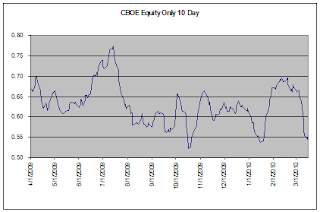 This is strange as I have found that the overall CBOE put/call reading and the equity only generally line up. As you can see in the chart below the last 2 times we saw extreme readings on the equity only the overall reading was also extreme.